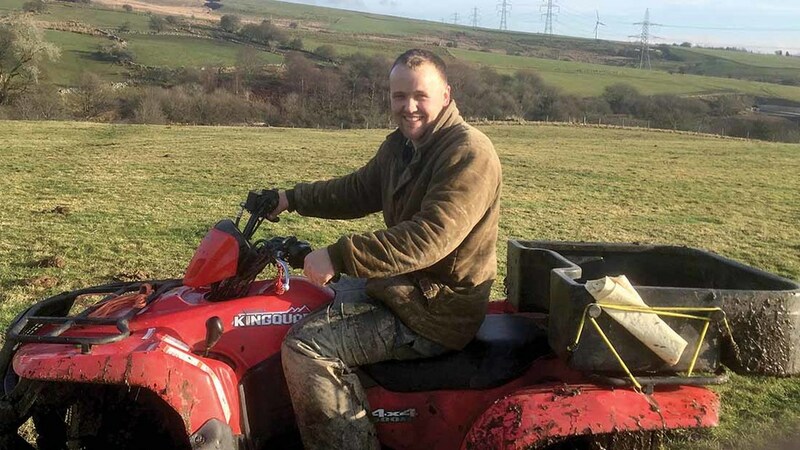 Karl Bowen, 29, farms at Bryncyrau farm, on the southern edge of the Brecon Beacons, with his partner Fiona, dad Brian and grandparents John and Gwynfa. They farm 485 hectares (1,200 acres), of which Karl farms and manages 242ha (600 acres) of lower pastures. Livestock: I run a flock of 300 Texel cross ewes, and a flock of 300 draft hill ewes from the home farm. They are put to the Charolais cross and Aberfield rams. Lambing usually starts in the first week of March. The scanning day is getting closer now and it is always exciting seeing what lambs we may have and how busy we are going to become March. All the lambs are sold through local markets which I am a strong believer in. I also look after 85 mostly black Limousin cows, which all go to British Blue bulls. I sell all my calves through the Sennybridge wean calf sales in autumn, which makes wintering cattle a lot easier. But saying that, we start calving from January onwards, so we need the room. Winter: We have had a busy winter so far. All the fencing was finished by the first of January, thanks to the dry weather we have had. Calving has started on-farm and it is all going well. Within four weeks 45 of our cows have calved, so that has kept me on my toes. The frosty weather has been a big help too and I managed to spread a lot of muck. Hopefully it will get the early spring grass to kick-off soon. The sheep sheds have also had a spring clean and are now ready to house the twin ewes, but for now we will keep them outside as the weather has been kind and they look very healthy out there. Brexit: Being a young farmer in the industry I think we are going to face some very uncertain times. Nobody knows what the future holds for us with Brexit looming. I do not see our Government coming out with any hard evidence that agriculture is at the top of the list when it comes to trade deals, and it baffles me Wales voted to leave when we are 80 per cent funded by the EU. I cannot see our Government making an equal contribution to agriculture and the rural economy, when public services and the NHS will be at the top of the list. However, as young farmers we need to be positive and look forward. It is down to us to put our views across so our voices are heard at government level and taken into consideration in the decision-making processes and future planning for agriculture. At the end of the day people need to eat and I intend to produce top quality food whatever the future may hold. Future: This year is going to be a year to remember, as I am getting married in June. On a more serious note, my passion is in farming and I intend to carry the family business on, hopefully one day I can purchase more land and not be a tenant farmer, but we will see.